With the annual review of what books we will require students to use in the following year came a discussion of the merits of a dictionary as part of this list. Like many schools we have implemented a 1:1 BYOD programme that means every child has full time access to the internet. The questions is does this negate the need for a dictionary or is there still a compelling case to develop dictionary skills. I was curious as to which approach would produce the most meaningful results and decided to explore the resources available online and compare these with a traditional dictionary and app based dictionaries. 1. eager to know or learn something: I began to be curious about the whereabouts of the bride and groom | she was curious to know what had happened. - expressing curiosity: a curious stare. 2. strange; unusual: a curious sensation overwhelmed her. Middle English: from Old French curios, from Latin curiosus ‘careful’, from cura ‘care’. Sense 2 dates from the early 18th cent. Google’s results are similar in some respects to Oxford’s but a few differences and advantages are immediately apparent. The most obvious difference is that online I am provided with the option to have the word read to me, useful if I am unsure of the pronunciation. I am also provided with a set of links to synonyms allowing me to expand the scope of my search or to check definitions of these words. As I searched for the word alone the results further down the page include links not entirely relevant to a dictionary inquiry such as a link to a company called Curious Films and Curious.com. Microsoft’s ‘Bing’ search engine provides similar results to Google with the same sentence about the curious whereabouts of our bride and groom. Adding the word ‘definition’ to my search provides more focused results including links to many online dictionaries including Oxford, Merriam-Webster, MacMillian and Collins. Each provides detailed results with examples of the word in use and links to synonyms and an option to have the word read. Some include translations to other languages, all are ad supported and offer a search option for looking within their service. 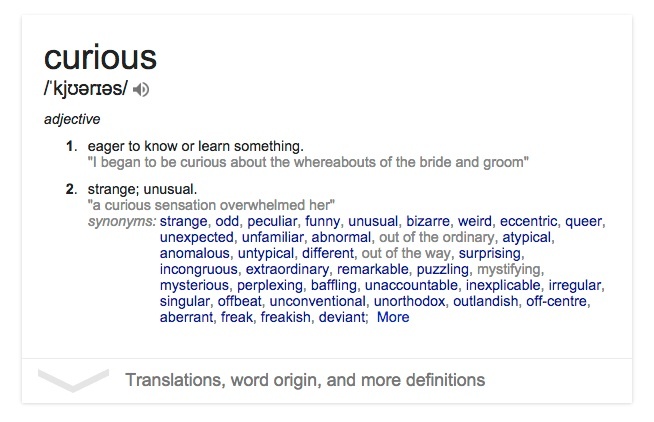 Adding selected terms to a Google or Bing search will refine the results provided, try searching for ‘curious synonyms’, ‘curious antonyms’, ‘curious quotes’ or 'curious etymology’. Other searches worth trying include 'books with curious in title’ and ‘music with curious in title’. Refining the results in each case to ‘Images’ or ‘Videos’ will produce different but in each case interesting and informative results even if many of the images are centred on a monkey named George. Being able to find images relevant to a dictionary search offers an opportunity for a class to apply ‘Making Thinking Visible’ strategies to a word study as students analyse what aspect of the selected word is depicted in the images presented by their search engine. In some cases the connection is obvious and possibly related to text in the image, in other cases the link is less apparent and can be an excellent starting point for discussion and analysis that a dictionary definition by the demands of its purpose will not foster. On this page I am not only provided with the definition of the word but have access to a detailed discussion of the nature of curiosity, its causes and theories about curiosity and relevant brain research. I am warned that the page relies too much on references to primary sources and asked to improve the page by adding secondary of tertiary sources. I am also provided with links including Wikiquotes and Wikitionary. On my Mac I use PopClip, an extension that allows me to quickly access a number of function when I select a word or phrase, one of these is a definition. i could also search for the word using the system wide dictionary or use the ‘Look Up’ function in Word/Office. The results are basic but include links out tomacq other services, similar results can be found in Windows and within eBook readers such as Kindle or iBooks. These options for included dictionaries with quick access to definitions allow the user to find the result they want while working with the word in context and mean the user is more lily to use the service compared to having to locate a dictionary on a shelf or even online in a browser. An update to the note taking service Evernote is said to include a feature that automatically includes links to information relevant to what the user is typing as they type including definitions. With the growth of App stores for iPad and Android a selection of dictionary apps have become available and offer most of the advantages of the online dictionary sites including easy search, text to speech options and in some cases facility to add notes. The better apps will also include options for copying information into documents, notes, email or sharing via social media. The advantage of most apps is that they use local data meaning the user has access to definitions when working offline. The disadvantage is that these dictionary apps can use significant storage space on the device. With apps and online services it is important to find versions using the accepted local spelling. With many of these services originating in United States of America there is definite bias towards American English. Schools in Australia need to make their students aware of this and suggest relevant apps of search modifiers to ensure relevancy. While there are numerous free dictionary apps finding ones that guarantee correct localisation generally means going to one of the better known publishers and these carry by app store standards significant prices. The Macquarie Complete Australian Dictionary is $19.99 and The Australian Oxford Dictionary is a $29.99 in app purchase after a free download. So is it time to abandon Dictionaries? It looks like the results are definitely in favour of the online and app based options. The range of services available electronically means that for anyone wanting to know the meaning of a word, understand its correct usage, research its history or locate alternatives even across languages the traditional dictionary can not compete. What is lost with online dictionaries is the knowledge and experience with alphabetical order that it builds. Traditionally it is dictionary work that teaches this skill beyond knowing simple A to Z but being able to sort a list accurately. The extent to which this skill is required beyond dictionary usage is unclear particularly as lists and the like will most likely be generated on a computer and then sorted automatically. Usage of alphabetical order persists as a relevant skill when using glossaries and indexes but even this is likely to be replaced by search as texts move into electronic formats. Alternative ways and rationales for teaching alphabetical ordering may be necessitated by a move away from traditional dictionaries.